One of the reasons many brides and grooms choose Mexico for their destination wedding is for the beautiful beaches. 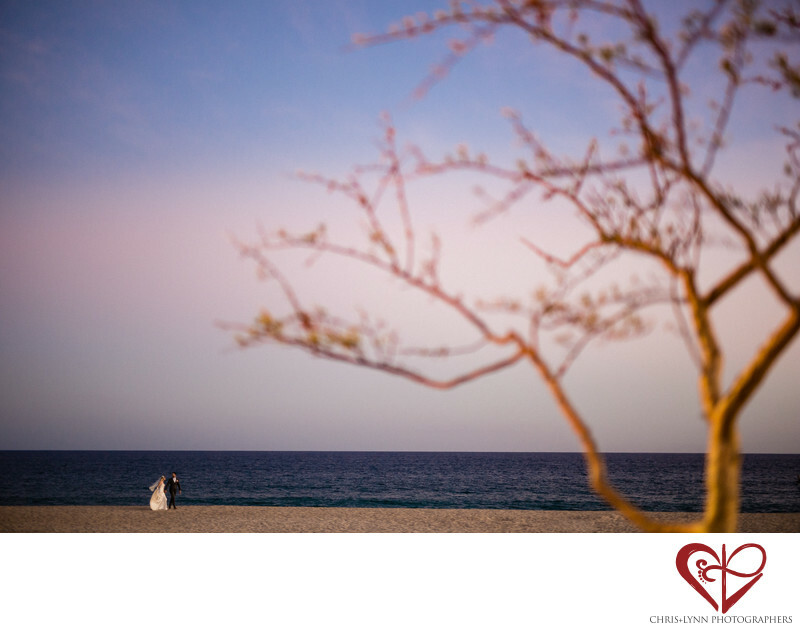 Romantic sandy beaches remain one of the most popular options for ceremonies and receptions in Los Cabos, Puerto Vallarta, Cancun, Riviera Maya, Tulum, and Punta Mita - all of which have gorgeous oceanfront locations for beach weddings. We love to photograph couples on the beach after their wedding ceremony, and will usually recommend the hour prior to sunset as the best time. This magic hour is when the light is soft and flattering and does not create harsh shadows. It is also the time of the day when it is not too hot, and couples can easily spend some time on the beach without getting too sweaty or uncomfortable. It's also so special to watch the sun go down with your new husband or wife - a great memory for your wedding day! In order to also have pure blue sky and blue ocean photos, it is also a great idea to schedule some portrait time during the day. This photo was taken just after sunset when the sky had lots of color in it. We had already photographed the bride and groom together on the beach and done some relaxed portraits to feature the bride's beauty and the couple's connection together. For this image, as they were walking back to the reception we wanted to create more of an environmental portrait. This image showcased the beach location, the sunset, and had a more striking creative composition. See more pictures from this Club Campestre wedding in this couple's featured wedding here. 1/125; f/1.4; ISO 800; 50.0 mm.